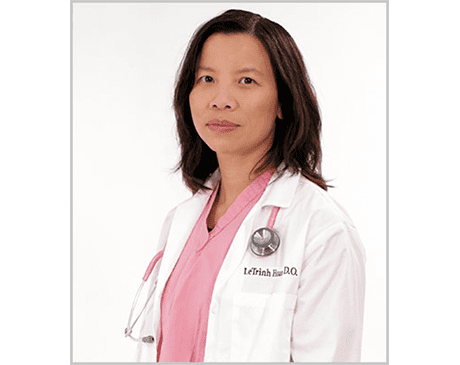 LeTrinh Hoang, DO, is an osteopathic physician focused on improving health without medication at her practice, Center for Natural Family Medicine, with offices in the Carthay neighborhood of Los Angeles and Arcadia, California. Dr. Hoang is a pediatrician by training, but has been studying osteopathy for more than 14 years and finds it very rewarding when she can help her patients get better so they no longer need to rely on anyone or anything. Dr. Hoang attended the University of California at Riverside and earned a bachelor’s degree in biology. She then went to the University of New England College of Osteopathic Medicine in Biddeford, Maine, for her medical degree and completed her residency in pediatrics at Loma Linda University in Loma Linda, California. According to Dr. Hoang, as long as the body breaths, it wants to recover. For patients still searching for answers, Dr. Hoang can help. We accept majority of PPO plans, with the exception of individual PPO. We take employer-provider PPO. Please call the office for additional information regarding insurance.